HI that looks like my cat . I have the same breed but mine is a male and i found him stray in a thorn bush down the street from my house, he kept mewoing and i put him back so i wouldn't get attached but he ended up fallowing me home; I never knew what kind he was. My cat is named izzy , Only cause we thought it was a girl at first.. his name was socks..
cause he is pure white with black feet. I just fell in love when I saw this picture of Manson. Manson may be deaf but one way to tell is clap or snap and see if he responds to the noise. Another is the vaccuum. Some cats fear the vacuum. 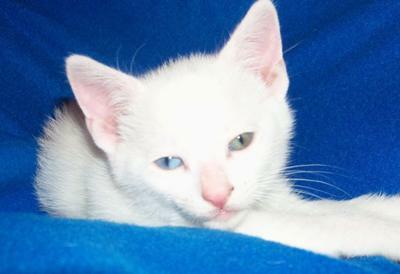 I have a blue eye white cat and is totally deaf. I call her Jenibelle. Jenibelle will be 4yrs old in August 18th,2011. When Jenibelle was young like little Manson.My Jenibelle would ride on my vaccuum.I thought it was cute and funny that she did that. She did not seem to pay any attention as for eye contact. I had her checked and the vet performed the same test I did. The snap and clap and banging and he said she was totally deaf.Jenibelle may be deaf but she is healthy and beautiful and stays indoors.All little Manson needs is love,care,and attention and he will grow to be a normal healthy boy whether he is deaf or not. Wishing you and little Manson comfort and joy always. Manson is the cutest thing! I love his eyes. And while it is true that white cats have a higher incidence of deafness (especially the ones with odd eyes), there are plenty of white cats who are born healthy, with perfect hearing and eyesight. I'll be sending my prayers Manson's way so that he grows up whole and healthy. I wish you both a long and happy life together, and thank you for sharing his story and picture.